two weeks ago, we'd like to let you know that Electronic Funds Transfer (EFT) is now also available to publishers located in Israel. Just log in to your account and follow these instructions to set up your bank account. You can also find a complete list of countries where EFT is offered here. Don't see your country or territory on the list? Not to worry -- we're working hard to expand our payment options, and will announce any updates right here. To follow up on our announcement two weeks ago, we'd like to let you know that Electronic Funds Transfer (EFT) is now also available to publishers located in Israel. Just log in to your account and follow these instructions to set up your bank account. 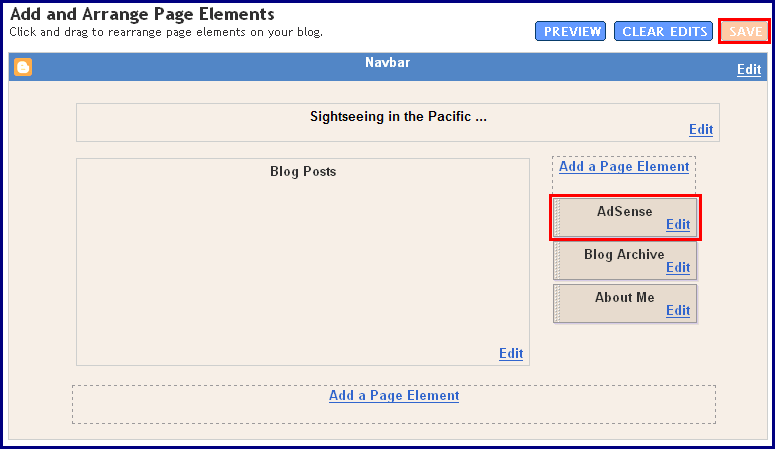 of Blogger in beta, we're happy to introduce you to the drag-and-drop AdSense widget! 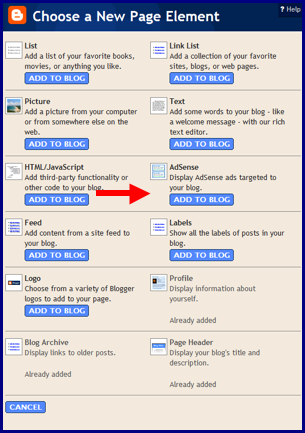 Using this new feature, you can easily add AdSense to your blog by following these instructions. 1. 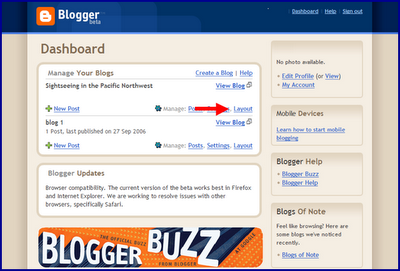 First, log into the new version of Blogger with your Google Account. 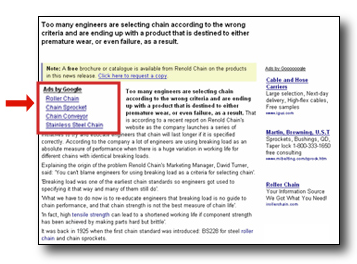 Click on the Layout link next to the blog where you’d like to feature Google ads. 2. 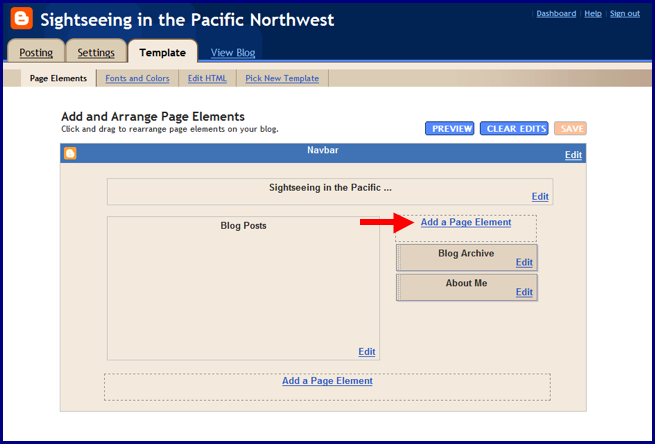 Next you should be taken to your Template – Page Elements page. Click on one of the Add a Page Element links shown below. 3. 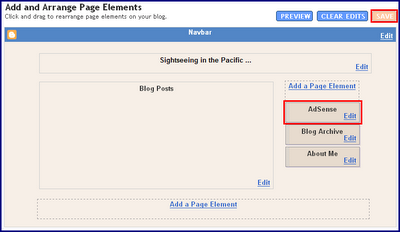 In the pop-up window, click the blue Add to Blog button underneath the AdSense option. 4. If you already have an AdSense account, simply sign in with your AdSense login; if not, you can create an account directly on this page. After signing in, you can select your preferred color template and ad format. When you're finished, click on the orange Save Changes button. 5. Now you can easily drag and drop your AdSense ad unit anywhere on your blog's template -- or delete it if you need to make changes. 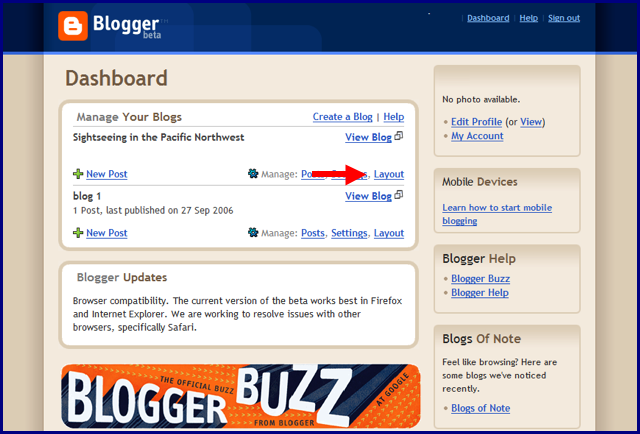 When you're all done, click the orange 'Save' button on the upper right corner and go view your new blog! We hope you find this new feature helpful when implementing your ads. Let us know if you have any comments or suggestions. If you have a blog on the new version of Blogger in beta, we're happy to introduce you to the drag-and-drop AdSense widget! 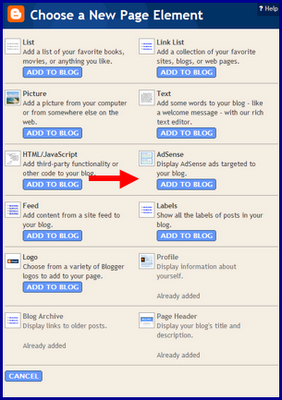 Using this new feature, you can easily add AdSense to your blog by following these instructions. What's up, Docs & Spreadsheets? for an overview of how the product works, or just sign up here. Have you ever struggled to keep track of different versions of your documents or site layouts while collaborating with other webmasters? If so, you'll find Google Docs & Spreadsheets the best pain reliever ever -- it's our new web-based word processing and spreadsheet program to help manage your site's content and easily share it with others. With Google Docs & Spreadsheets, you can edit and save in HTML to create mock-ups of your webpages. 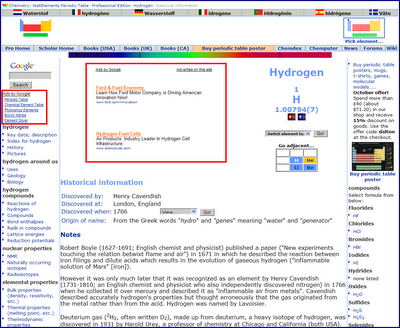 You're also able to access your files from any computer via a web browser, and easily send them to collaborators to review and edit. Even more exciting, you can view all past revisions to your file, so if you change your mind about that bright purple highlighting after you've put it into your document, simply revert back to a previous version. Google Docs & Spreadsheets also provides an easy way to distribute content. Your users won't need to download anything from your site; just create your content in Docs & Spreadsheets or upload an existing file, publish it, and then link directly to the file from your website. Aside from all the web publishing benefits Google Docs & Spreadsheets offers, it's also a great tool for managing a small business. You can collaborate and share information about your online ad activities, draft proposals and budgets, and keep track of your Google Analytics tags all in one place. Many of the entries on this blog wouldn't have turned out quite so well without team collaboration on the content using Docs & Spreadsheets. Google Docs & Spreadsheets is free, secure and easy to try out. Get started by uploading your desktop files. Check out the product tour for an overview of how the product works, or just sign up here. Seeing higher earnings in your channel reports? 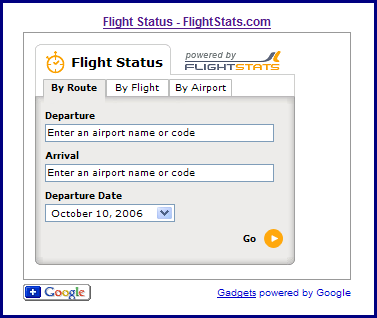 Let's say you've set up 2 URL channels - one to track example.com and to track www.example.com/page. The URL channel example.com will track clicks and impressions from all subdomains, subdirectories, and subpages of example.com. As a result, one click on www.example.com/page will be tracked on both of your URL channels, which means you'll see two clicks recorded in your channel reports. 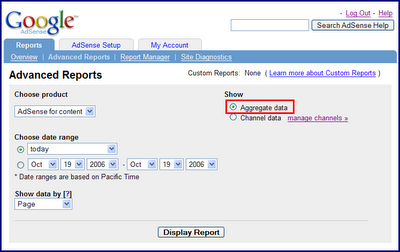 However, your aggregate reports will show you the correct number of clicks, one, with no data duplication. You can learn more about how URL channels will track specific pages in our Help Center. Your ads are being tracked on both a URL and a custom channel. Now let's suppose you have a URL channel for example.com and a custom channel called Example Homepage, which you're using on the homepage of example.com. When you receive a click on the ad unit tagged with your Example Homepage custom channel, it will also be tracked on your example.com URL channel. Just like above, this means that you'll see two clicks logged in your channel reports, but only one in your aggregate reports. Your ads are being tracked on multiple custom channels. So you've taken advantage of our new feature, and you're tracking each of your red leaderboards with 2 custom channels -- one called Red_ad_units and one called Leaderboards. One click on a red leaderboard will be tracked in both of your custom channels, so you'll see twice as much data when you compare your channel reports to your aggregate reports. Of course, this doesn't mean that you shouldn't set up multiple URL and custom channels to track specific pages and ad units. 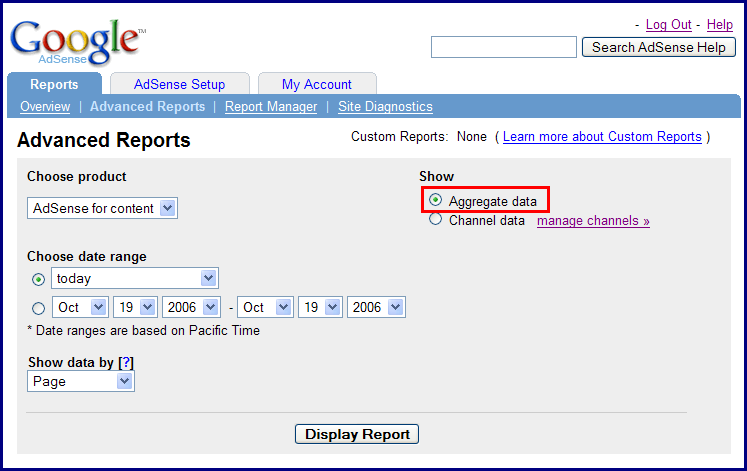 But if you'd like to view the overall performance of your account, visit your Advanced Reports page, select the Aggregate Data radio button, and click Display Report -- you'll then see your reports without any duplicate data. Your ads are being tracked on multiple URL channels. When UK-based WebElements.com started using AdSense in late 2003, their earnings averaged out at a low daily rate. 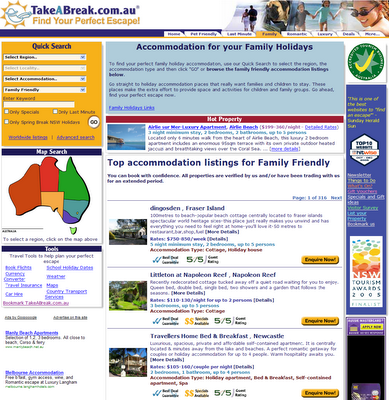 In January 2005, WebElements began to focus on optimisation, experimenting with different ad colors, ad styles, and page locations. They found success by adding link units to each page of their site, placing Large Rectangles directly before and after their content, and adding a Wide Skycraper to their left sidebar. In the week following the optimisation, WebElements saw revenue increase by 500%. They then made other small placement changes to the site, which resulted in a spike doubling the revenue yet again -- as a result, the site was earning over 1000% its original earnings for some of the year. Today, this ad revenue enables WebElements to further develop their site. The company advises that "it is important to experiment with colors, ad sizes, and locations on the page, as the audience for one type of web site may well respond to ads differently to another. It is worth experimenting with colors that blend with site design and others that show some contrast. It is also a good idea to use Adsense channels to run different color schemes in different channels at the same time and to wait for a week or so before deciding which colors work best. And, of course, content is king." 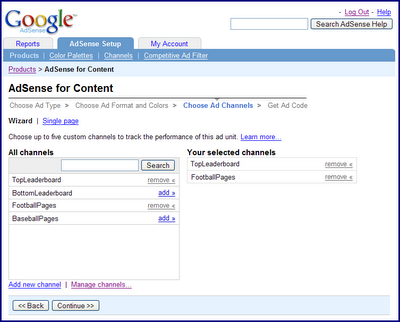 As of today, it is now possible to assign multiple custom channels to a single ad unit. This feature enables you to track your ad performance with greater flexibility and view more granular information. When generating your ad code, you'll be able to add up to 5 custom channels to a specific instance of ad code. What's the benefit of tracking with more than one custom channel? Well, multiple channels can be very useful when you want to track one ad unit across several different metrics simultaneously. For example, let's say you run a sports website and you've placed a leaderboard at the top and bottom of every page. To track the performance of the ad placement, you've created two custom channels -- 'TopLeaderboard' and 'BottomLeaderboard' -- and regenerated your ad code appropriately. But what if you also want to compare your football pages and your baseball pages at the same time? With multiple custom channels, this isn't a problem. Just create two new custom channels called 'FootballPages' and 'BaseballPages', and add them to the appropriate ad units. Now your leaderboards will each be tagged with two custom channels that let you know which position they're in (top or bottom), and the type of page on which they appear (football or baseball). 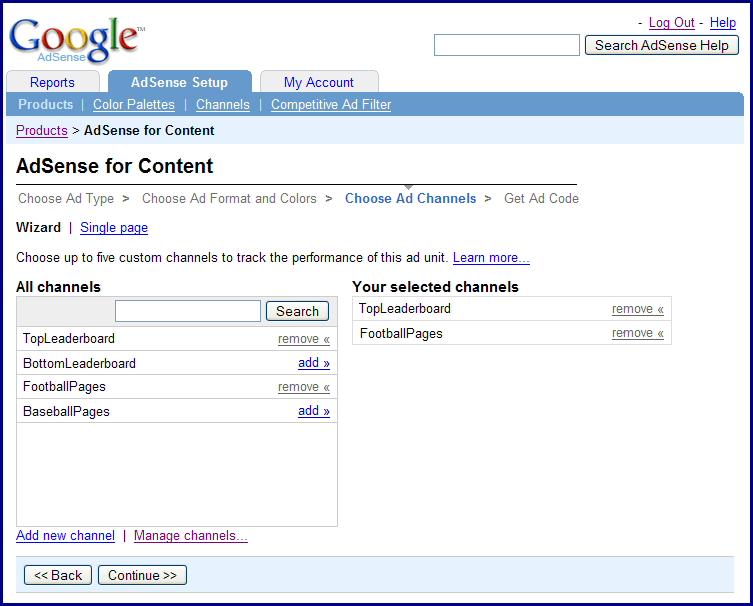 Please keep in mind that ad units tagged with multiple custom channels will log impressions or clicks in each channel. As a result, you'll see a higher number of impressions and clicks when you view your channel reports than when you view your aggregate reports. If you'd like more information about setting up multiple channels, please visit our Help Center. Are you a publisher located in the Czech Republic, Finland, or Slovakia? If so, we're happy to let you know that Electronic Funds Transfer (EFT) is now available to you. Sign up today to receive future payments directly in your bank account -- remember, the 15th of any month is the deadline to update your form of payment for that month's payment cycle. If you're having difficulty receiving your test deposit, you might find our troubleshooting tips useful. Even if your site is well-designed, with colors that look great and ad formats that your users respond well to, you still might hear a nagging voice inside your head that says, "There must be more I can do!" If this sounds familiar, then we've got a cure -- link units work wonders when you're looking for additional ways to give your AdSense performance a pick-me-up. They offer your users fresh, new content and can be customized and tracked just like standard text ads. Looking for more ideas? 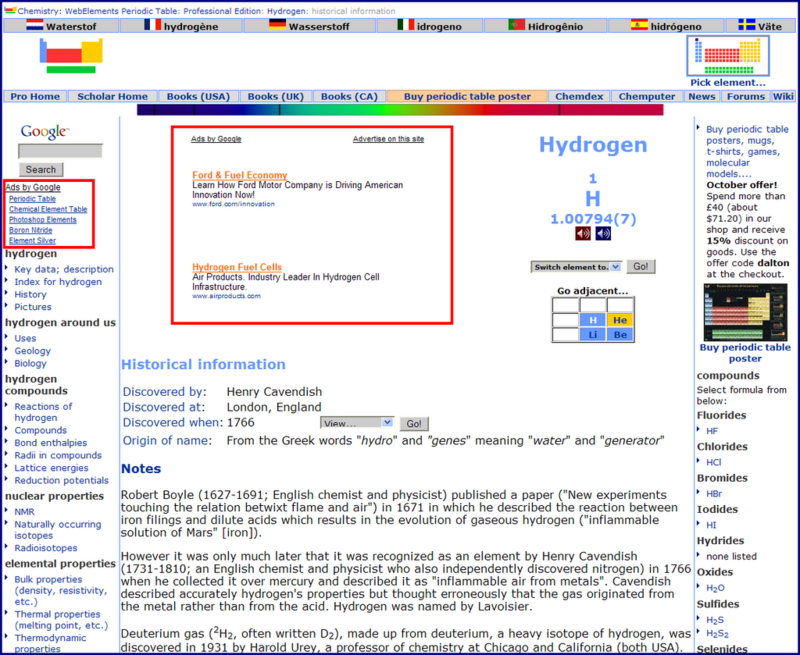 Our link unit example page might help. Link units proved to be the missing link for several of our publishers- you might remember reading about how Engineeringtalk, Ask The Builder, and PCFreunde saw their AdSense earnings soar after adding link units to their pages. With 12 different sizes, you're bound to find a size that fits snugly into those "hard to reach" areas of your site. , saw an increase of 30% in his AdSense revenue after he changed his layouts and introduced image ads. Now, AdSense revenue makes up about 10% of his company's overall revenue. Craig noted that AdSense was "a key element that helped us to move quickly from just another start-up to a leader in the online accommodation industry." Read more about Craig's story here. To continue the Australian theme from last week's post, we'd like to share a recent case study which focuses on an Australian publisher. 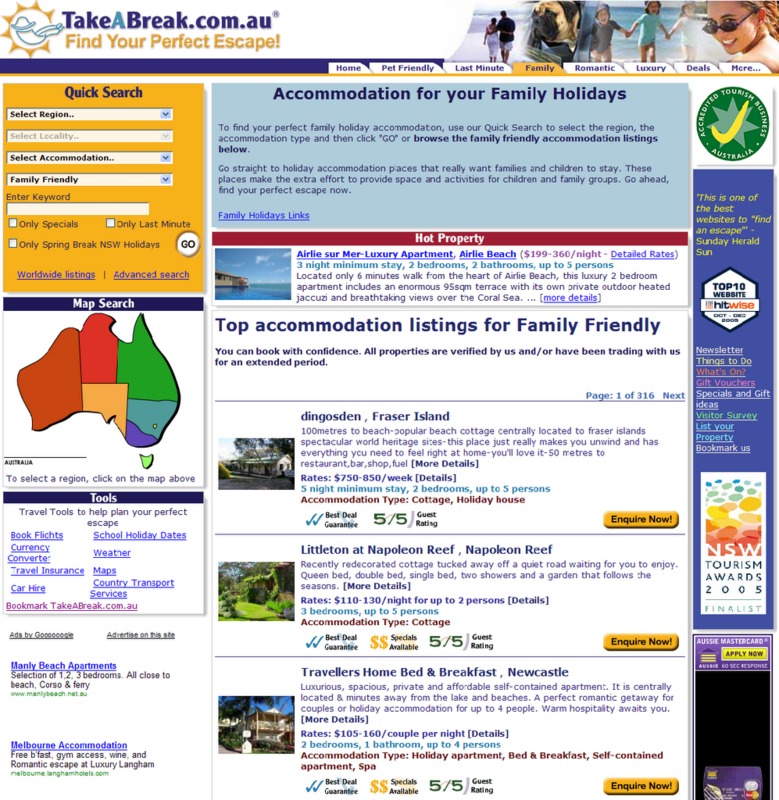 Craig Davis, General Manager of TakeABreak.com.au, saw an increase of 30% in his AdSense revenue after he changed his layouts and introduced image ads. Now, AdSense revenue makes up about 10% of his company's overall revenue. Craig noted that AdSense was "a key element that helped us to move quickly from just another start-up to a leader in the online accommodation industry."